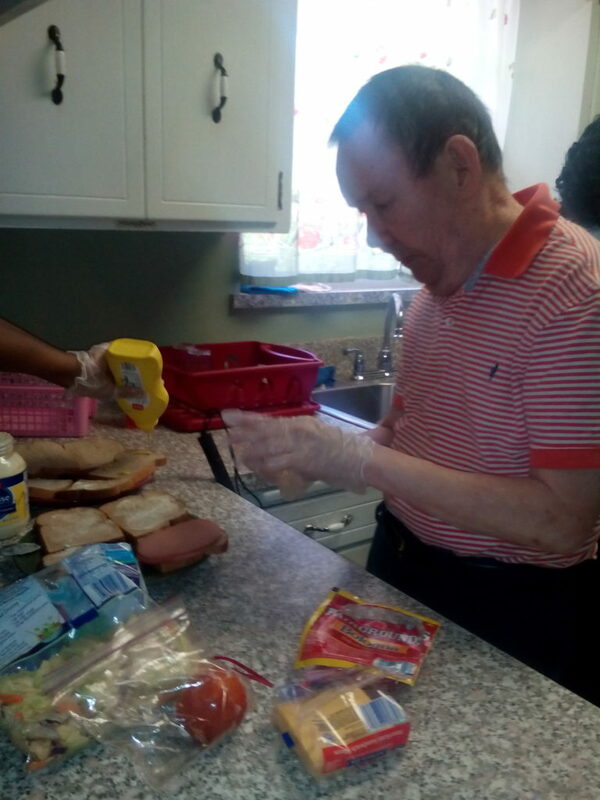 This month’s Mission Moment focuses on three residents in The Arc Jacksonville group homes. Group homes are perfect for individuals looking to live independently with some assistance from staff, while also building social skills and learning to live among their peers. Residents work with staff to help achieve their personal goals and strengthen their independent living skills. Read below to see how Carol, Timothy and Ronald have flourished while living in their group homes. When Carol moved into Grove House she was shy and struggled to make daily decisions. After much practice and hard work over the years, her communication and socialization skills have improved. Carol is now able to make decisions on where she would like to eat and what color to paint her room. Carol has increased her level of independence by taking charge of her medication regime and learning more about each pill. During the day Carol attends the Westside ADT Program where she does contract work and loves to see the staff and her friends. How long have you lived at Grove House: Since Grove House opened in 2009. What do you enjoy most about Grove House: I enjoy going on trips with my peers and staff. What have you learned since living at Grove House: I’ve become better at taking my medication on my own. I now know the colors and names of each pill I’m supposed to take. What is your favorite thing to do: Going out to eat. When Timothy first came to the Kaden Road group home in May 2005, he wasn’t very social. He spent more time in his room than with his housemates and group home staff. In 2011, Timothy was diagnosed with Retinitis Pigmentosa, a degenerative eye disease that will cause him to become legally blind. This diagnoses changed Timothy’s perspective, and he became eager to increase his independent living skills. By using his other senses such as touch and sound, he’s learned to recognize different objects he uses in everyday life. Over time Timothy is cooking more, he’s able to load and unload the dishwasher and he washes his clothes with assistance from staff. In addition, Timothy has become more social and enjoys going on community outings. Timothy is a happy and quiet individual who brings joy to the people who know him. What do you enjoy most about living at Kaden Road: Being able to live independently and watching TV with the other guys at the group home. Favorite thing to do: Going out into to the community to the Dollar Store to purchase collectibles. What have you learned since living at Kaden Road: How to set the table, wash clothes, make my own sandwich and prepare meals with staff assistance. Ronald was introduced to The Arc Jacksonville when seeking a day program that would assist his goals to expand social skills and to adapt to different environments. Ronald found that opportunity at the Arc’s Westside location where he was accepted “with open arms.” Ronald moved into the Jammes Road group home in September 2014 and adapted quickly to the environment and the other residents. Ronald is non-verbal and communicates through body language signals. His smile is a clear sign that he is enjoying himself. Ronald enjoys music, strobe lights and beaded necklaces to twirl. He is working daily with adaptive feeding devices to strengthen his handgrip.